Let the past be the past. 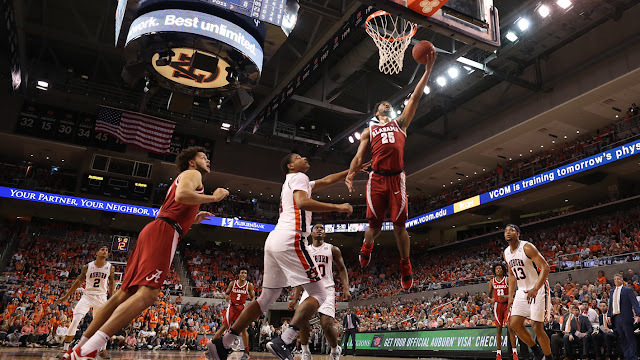 The Alabama men's basketball team must adopt that mantra as they seek to end a two-game losing streak on Saturday when they host the Arkansas Razorbacks. Both teams enter with 8-7 conference records. In fact there are six teams in the league currently sitting at 8-7 so this game suddenly looms large for both programs as they seek to land a top four seed in the conference tournament. The university has announced that the game is a sellout. Game time is 5 P.M. CT. SEC Network is handling the television duties. Click the links for team and KenPom stats. My Two Cents: When I post my season review in the next month or so, I probably won't point to this game as the biggest game of the season for Alabama. However, right now, this is the biggest game of the season for Alabama. Yes, I can understand the frustration for Alabama fans after a 19-point blowout loss at Auburn. It's been one of several frustrating nights we've spent with this team. I would ask though that fans pause a moment and realize that this team still has a chance to finish in the top four of the standings (they were picked to finish fourth in the preseason poll), and play in the NCAA Tournament for the first time in six seasons. For a program that is under construction that would have to be considered progress. Also something to remember is that Alabama has probably not yet locked up a bid. They likely need another one to two wins to feel comfortable on Selection Sunday. It would be ideal if our guys could lock those wins up in the final two home games of the season before finishing the season on the road in College Station. What adds to the tension of this next week and a half is that all of Alabama's remaining opponents are also trying to lock up bids (or avoid a slide onto the dreaded bubble) so our guys have to expect the best effort from the opponent, while also giving their best effort. Needless to say, I'm happy that the team finishes with two of the three remaining games at home (6-1 at home in conference play so far). The university has announced that Saturday is a sellout, and I hope that everyone with a ticket is in Coleman and ready to get and stay loud. If you can't make the game, please give your ticket to someone else, or offer it on social media (I'm already seeing fans on social media asking if any tickets are available). These next two games in Coleman are crucial games, not just for this team, but the program. The program desperately needs to break the tournament drought as it seeks to reestablish national relevancy. Forget your sour feelings after the game on Wednesday night; get out to Coleman and cheer this team to a victory. Arkansas is a really good team and our guys can use the support. Players to Watch: I thought John Petty might be breaking the road curse after he had a respectable outing in Lexington, but the road woes returned at Auburn. He made a late three to avoid his second goose egg in scoring this season (did not score at Florida). He did have four assists, but also three turnovers. He also seemed rattled by the environment. Needless to say, it wasn't a great night for John. For all of his struggles on the road, John has been great most nights in Coleman, therefore I expect John to bounce back on Saturday. Anyone who watches SEC basketball knows how good Jaylen Barford and Daryl Macon are for Arkansas, but it's been the emergence of freshman Daniel Gafford that has helped this Razorback team become a more balanced team on both ends, helping to offset the loss of Moses Kingsley. Gafford is similar to Donta Hall in that he is a long, athletic forward that can be a disruptive force on the defensive end, and an exciting finisher on the offensive end. It's quite possible that Donta and Gafford are the two best dunkers in the league this season, and I wouldn't be surprised if both guys put someone on a poster Saturday night.